After a brief facebook chat on the Eurocrime genre yesterday evening in which I said if I was forced to pick the best film of the genre, Carlo Lizzani's Banditi A Milano would probably be it. This inspired me to dig out the US one sheet I tracked down after falling in love with the movie. 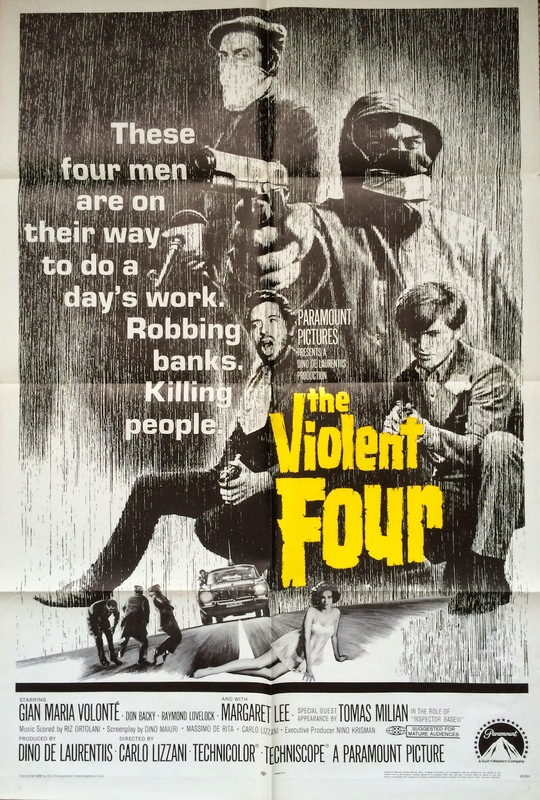 Retitled as The Violent Four for US consumption and released by no less a studio than Paramount. Having searched all the usual places it seems the film doesn't have a legitimate release anywhere at the moment (If I'm wrong then please let me know), a travesty considering not only it's importance to it's genre, but also it's sublime quality. I'd love to see Arrow work their magic and deliver a definitive release of this classic. In spite of all my best intentions, it's clear I've been neglecting this blog for a long time. The odd post here and there is not what I had in mind when starting up back in November 2010. Much has happened since then and I have plenty of good reasons for the decline in activity (which I won't bore you with) , and one not so good one, which is that I've become a very lazy blogger. I have so much I want to do and so little time in which to do it, but I do intend to ramp up my rate of posting to at least two per month! I do have lots of good stuff to share, so please don't give up on A Hero Never Dies just yet.